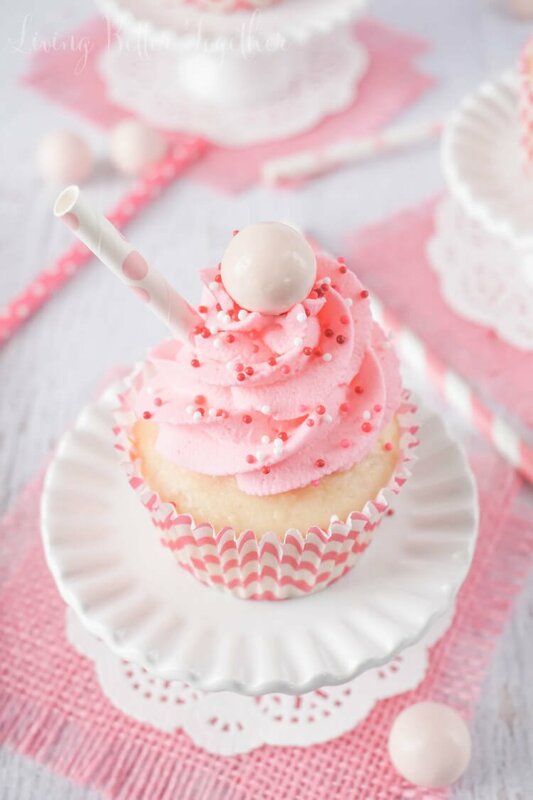 These Strawberry Milkshake Cupcakes have a vanilla malt base and are topped with strawberry milk whipped cream frosting, sprinkles, and a whopper! Make them for an instant trip down memory lane. So it’s Super Bowl Sunday, and though I live in New England, I honestly don’t give a crap. Seriously, though, if I hear one more thing about deflated balls, I’m going to scream. I swear the next person to post something about it on my news feed is going to be hidden so fast it’s not even funny. Okay, enough with venting my irritation. Unfortunately, unlike the last two years, I won’t be doing the 15 Days of Love. It became too stressful and exhausting and really began to take away more than add to the one thing that’s most important in my life, my marriage. So we’re going to keep it low key this year with a couple of recipes, ideas, and stories. Don’t worry, the Breakfast and Batman/Dinner and The Dark Knight tradition will continue… it might just be one of my favorite traditions we have! I’m not sure if you guys noticed, but I didn’t post a single cupcake recipe last month! What the hell is wrong with me, I’ve been failing you guys! 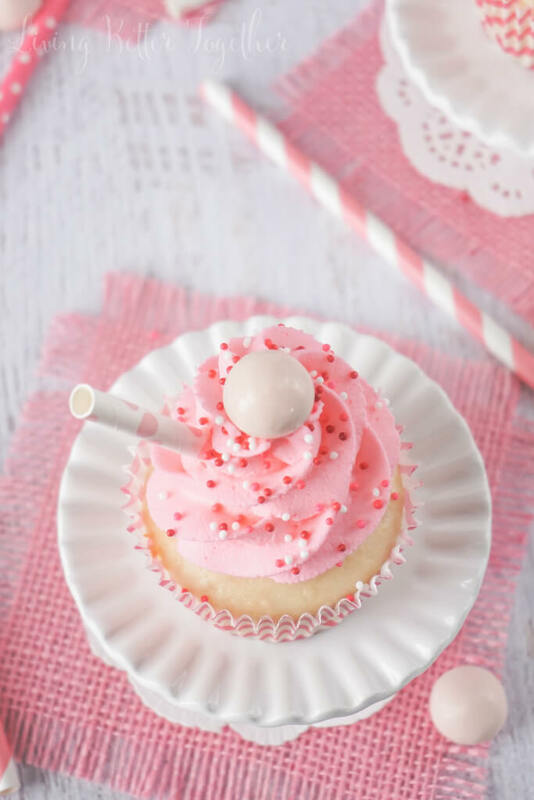 So I’m kicking off the month of love with these sweet little Strawberry Milkshake Cupcakes! These guys weren’t even on the blog menu until last Monday night. We stopped into the store to grab a few things before hunkering down for Blizzard Juno. I went to grab some candy bars to make cookies with and saw these boxes of Strawberry Milkshake Whoppers! 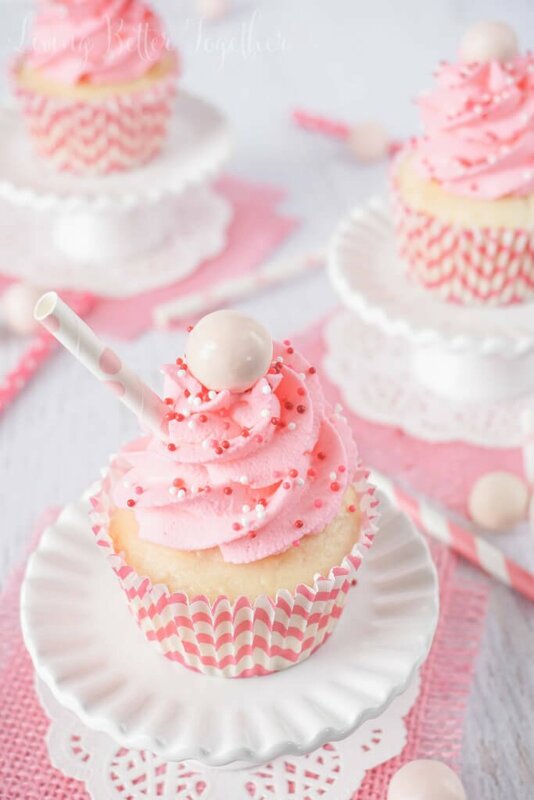 I immediately envisioned these adorable little cupcakes that were all pink and fun with straws. I think that vision really came to life, what do you think? I decided to do a simple vanilla based cupcake with a little malt powder thrown in for extra milk shakey-ness. Top it off with a strawberry milk whipped cream frosting and a whopper and you’ve got some of the cutest little cupcakes around. Oh, but don’t forget the straw! These cupcakes don’t have any oil or butter in them, it’s sour cream that keeps them light and moist. They have a light flavor, not too overwhelming, but just enough to make you reminisce about those childhood days with a glass of thick pink strawberry goodness! These Strawberry Milkshake Cupcakes have a vanilla malt base and are topped with a strawberry milk whipped cream frosting, sprinkles, and a whopper! Make them for an instant trip down memory lane. Fill each liner with about 1/4 cup of batter. 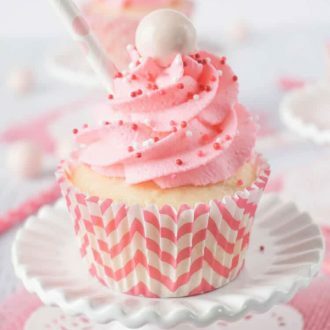 Turn oven down to 350 F.
Bake cupcakes for 18 – 20 minutes. Test with a toothpick to check that they are done, transfer cupcakes to a cooling rack. Combine all ingredients in a stand mixer or large bowl and whip until frosting stands stiff, about 2-3 minutes. DO NOT OVER MIX. Pipe onto cooled cupcakes, top with sprinkles and enjoy. Paper straws are optional but should be cut in half before adding. Pin the image below to save this recipe for later. Oh. My. Gosh. 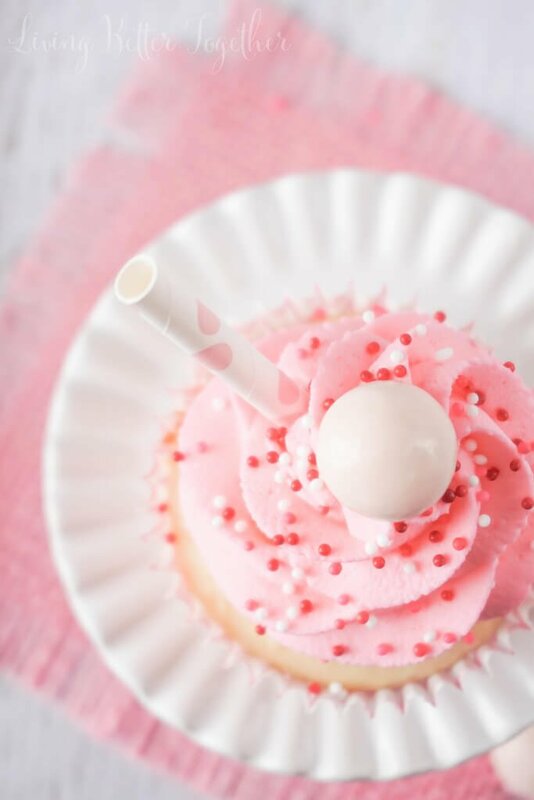 These are the cutest and most delicious cupcakes ever! Thank you for the recipe and idea. I am elated with how these turned out!! I’m so glad you enjoyed them, Kelly! Happy Valentine’s Day! What’s a whopper, that big sweet on top? And where can I find it? A whopper is a kind of candy, you can find them in the candy aisle at most major grocers in the US. I’ve only seen the strawberry ones at Walmart. Can these be frosted and frozen? I’m thinking about these for my daughter’s wedding. I’m not sure, I’ve never tried freezing them. I’m sure the cupcakes themselves would be fine to freeze, but I’d be hesitant to freeze the frosting. Oh my word these are so so pretty!! How far did you fill the cups? There is a “?” In the #4 instruction for the amount. I usually make cakes, so clueless on cupcakes! Hi Miriam, it should be 1/4 cup, sorry, i made some technically changes and it turned some of my fractions into ? and I’m still trying to catch them all. Thank you so much! I am making these today…can’t wait! Oh My Word! DELICIOUS!!! AND….just precious to look at! Thank you for a gorgeous recipe! You are so welcome, Marian! I’m glad you enjoyed them! Oh my heart! It’s so brilliant! this pictures are Mouth watering. Hi Mariah, I’m sorry but I’m afraid I don’t have answers to your questions as I’ve never made it with any of the alternate ingredients you mentioned so I can’t speak as to the amount and how it would turn out. Look at that pretty cute color. They look so delicious and sweet. 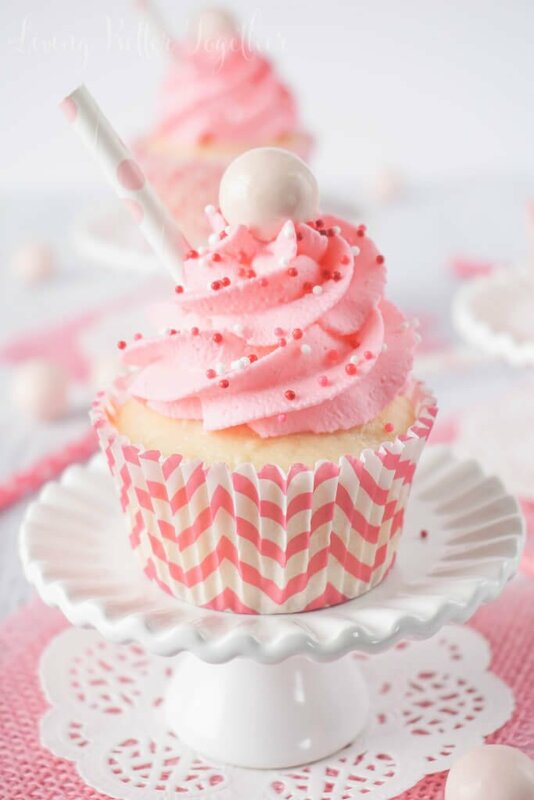 I am thinking to make these on my friend’s birthday which is in this month.Thank you for the recipe Rebecca!! I am sure my friend will definitely love it. Hi Beth, you can make the frosting with just the vanilla pudding mix, powdered sugar, and heavy cream, the powdered milk mixture isn’t necessary, but you could add a teaspoon of malted milk powder if you want.